Europe’s new overseas aid policy, the Agenda for Change, is aimed at focusing assistance on the 48 least-developed countries, nearly all of them sub-Saharan Africa. The plan, first unveiled in October 2011 and approved in May 2012, puts the emphasis on improving governance and social protections in developing nations, while also supporting agriculture and expanding energy access to drive growth. The shift in funding would be in line with commitments donor nations made in December 2011 in Busan, Korea, where the European Union, United States, Japan and other big donors also agreed to strengthen development aid coordination to help the most impoverished countries. The Agenda for Change is also seen as complementing the EU’s support for a successor to the United Nations’ Millennium Development Goals, eight poverty-fighting targets that expire in 2015. But anti-poverty campaigners, while supportive of the Commission’s effort to improve aid effectiveness, fear the plan will leave some needy people in emerging countries helpless. They also worry that EU nations, struggling with their own economic and fiscal challenges, will scale back their commitments to do more for the world’s poor. Piebalgs in October 2011 unveiled plans to overhaul overseas aid to provide more help for the poorest and most vulnerable countries. Known as the Agenda for Change, the policy shift is aimed at concentrating aid money in the 48 least-developed countries (LDCs), 33 of which are in sub-Saharan Africa, and in improving governance, social protections, agriculture and renewable energy. The shift in funding would be in line with commitments donor nations made in December 2011 in Busan, Korea. The resulting Busan partnership is also aimed at strengthening donor coordination to avoid competing projects and to concentrate efforts to help impoverished countries. “The promotion of human rights, democracy, good governance and of inclusive and sustainable growth will be the two pillars of our policy,” Piebalgs said at the time. “I want EU aid to be focused on the most strategic and growth-oriented sectors, such as agriculture/food security and energy, while ensuring it is inclusive by allocating at least 20% of EU aid to social protection, health and education. It will also go to most-in-need countries so that we can really make a difference," Piebalgs said. The EU provides aid in about 150 countries, including 43 of the most fragile nations. Nearly one billion people, or one-in-seven on the planet, live in the LDCs. The Agenda for Change gives more attention to the poorest countries as well as the former Soviet countries on the EU's eastern flank – reflecting a policy priority of Poland, which held the rotating EU presidency when the aid proposal was unveiled. EU officials also see a more focused aid programme as key to supporting the successor to the United Nations’ Millennium Development Goals, the eight anti-poverty targets that expire in 2015. The EU presented its own framework, ‘A Decent Life for All’, for the global successor to the MDGs on 27 February 2013. A post-2015 roadmap will be forged at the UN level, and a special meeting of the UN General Assembly will examine progress on the MDGs in September 2013. EU officials say aid is just part of the solution – they see encouraging private investment and expanding lending to small businesses as important parts of the change from traditional cash assistance. But in introducing a new aid scheme, some of Africa’s rising stars, including Ghana, could gradually lose EU assistance. Emerging countries like India and Brazil could see the loss of development assistance, nations with robust economies but pockets of extreme poverty. In India, 27% of people are impoverished and nearly half of the country’s poor people have no modern sanitation, according to the UN Human Development Report. In several middle-income South American and Asian countries that could see aid levels fall, poor water and sanitation compound poverty in urban ghettoes and rural communities. While the EU’s foreign policy muscle is often weakened by national divisions, on aid it’s a superpower. The EU is collectively the largest aid donor, providing €53 billion from national governments and EU institutions – or 55% of the world total in 2011, according to the Organisation for Economic Co-operation and Development. European leaders have traditionally seen overseas assistance as an extension of their “soft power,” agreeing to provide annual development aid equivalent to 0.7% of gross national income by 2015. While charity and human rights groups welcome Europe's continued commitment to developing countries, they fear draft EU proposals could harm efforts to finance water, sanitation and other projects in Latin America, Asia and possibly some sub-Saharan African countries. 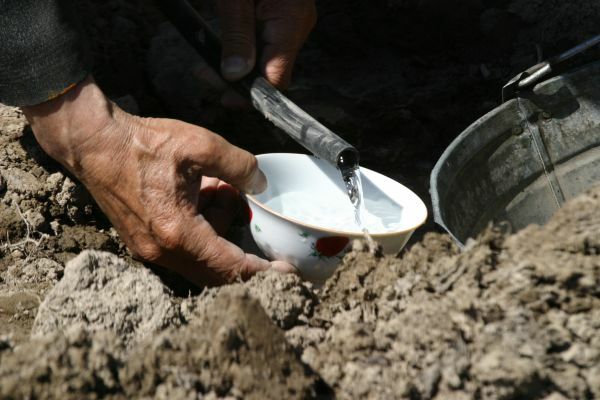 Catarina de Albuquerque, the UN’s first special rapporteur on the right to safe drinking water and sanitation, told EURACTIV that the EU’s Agenda for Change “can be detrimental for the progress of rights” if it leaves some poor communities vulnerable. “I’m not saying the intentions are bad, I’m saying the outcomes are bad,” the Portuguese lawyer said in an interview ahead of the 2012 World Water forum, saying the EU Agenda for Change could harm needy communities of Latin America, a region that has made steady development progress but still needs help in reducing poverty and income inequality. Rights and charity campaigners wary of the EU’s aid proposals say a country’s economic ranking should not be the sole determinant in determining who gets help. The EU plan “does not take into consideration the fact that 75% of the world’s poorest live in those middle-income countries,” the Brussels-based Concord confederation of relief and development organisations says in a recent review of the EuropeAid proposals. The poverty-fighting group ActionAid, meanwhile expressed concern about the EU’s pledges to help the private-sector. “In future much more aid will be channelled through the private sector to leverage more funding. However, it is not clear how this leveraging will see aid reaching the poorest,” the South African group said after the Council approved the Agenda for Change. But money is shaping as a challenge for Brussels and cash-strapped national governments. Amid fears that development aid would be a victim of an austere 2014-2020 budget, Piebalgs appealed to EU leaders’ in February 2013 to make up any difference in funding cut out of the Commission’s budget for EuropeAid. Speaking at an informal meeting of EU development ministers in Dublin on 12 February 2013, Piebalgs said he regretted budget cuts proposed by national leaders, which reduced by €6.3 billion the amount sought by the EU executive. At a summit just four days earlier, the leaders agreed to spend €58.7 billion over the next seven years to help poor nations, nearly the same as the previous budget but less than what the Commission sought for EuropeAid. “Cuts must not cost lives,” Piebalgs said, adding that the EU and most national governments had promised to allocate 0.7% of gross national income for development purposes by 2015. “This is the absolute minimum. Today, the EU stands at 0.42% - just a little more than a half. If the EU wants to address the problem of development, it needs to deliver on its promise,” Piebalgs said. European leaders committed to boost overseas aid to 0.7% of GNI at a meeting in June 2005 (see European Council Conclusions, paragraph 27). An exception was made for the 12 new member states that joined the EU in 2004 and 2007, which were handed a lower target of 0.33% of GNI. Several countries, including debt-plagued Greece, Italy and Spain, appear unlikely to reach their targets by 2015. That year, 2015, also marks another important spot on the development calendar, the year when a successor to the MDGs is to be launched. In the lead-up, European development ministers have agreed that the EU will speak with one voice in future international negotiations on new targets for sustainable growth and eradicating extreme poverty. At meetings held in Dublin in February 2013, the ministers agreed that the EU should take a central role in shaping a new framework for the United Nations’ poverty-fighting targets to succeed the MDGs. “This issue will be at the top of the international agenda for the next two years and I am delighted that European development ministers today agreed to seek to achieve agreement on one set of development targets after 2015, which incorporate environmental sustainability,” he said. “Our aim is to eliminate extreme poverty within one generation. We believe we now have a historic opportunity to achieve this goal,” Costello said from Dublin. The MDGs, agreed in 2000, include ending extreme poverty and hunger, expanding education, improving healthcare, and promoting sustainable growth. The Commission’s ‘Decent life for all’ communication outlines proposed negotiating positions on the successor to the MDGs. Piebalgs, called for a “new vision” to replace the MDGs, which were the “major tool” to combat poverty but have fallen short of their targets in many areas. “It is finally recognised today that eradicating extreme poverty across the globe in a single generation is within reach,” Piebalgs said on 27 February 2013 in announcing the communication, or set of recommendations, with Environment Commissioner Janez Poto?nik. “It is not only a question of whether all the resources to achieve these goals are available, but rather whether we have the political will to do so and the right international framework to guide it,” the development commissioner said. The EU’s framework calls for improving living standards; promoting sustainable development and political empowerment; protecting natural resources; fostering peace and security; and ensuring global “equality, equity and justice,” Piebalgs said. The 20-page document sets no specific goals like those set out in the eight MDGs, opening the door to criticism that it is setting no measurable goals for its ambitions. The proposals came eight months and a week after European leaders presented bold plans for a ‘green growth’ agenda at the UN Conference on Sustainable Development, but left without the firm commitments and compulsory targets they had hoped to achieve. The Commission’s ‘Decent life’ plan says that reducing poverty will not happen unless action is taken to address climate change and depletion of natural resources. The MDGs have been hailed for encouraging investment in childhood health, hygiene, education, nutrition, safe drinking water and other milestones. Yet many goals are not likely to be achieved. UN figures show that 1.4 billion people – 20% of today’s world population - live in extreme poverty. More than 2.6 billion people do not have access to latrines and some 1 billion lack safe drinking water. Chronic hunger affects more than 800 million people, many of them in sub-Saharan Africa. Meanwhile, conflicts present another challenge for aid and the fight against poverty. The Commission estimates that some 1.5 billion people live in conflict areas, including Mali, where European troops intervened in 2013 to bolster the struggling government. The EU later organised a donor conference to support Mali and its Sahel region neighbours. Such conflicts pose a threat to the Agenda for Change in an EU where austerity decisions are weighing on policy. In Mali, for instance, the EU is committed to a long-term development and reconstruction plan in addition to training police and soldiers. “We have committed to resume our development assistance to Mali, which is worth some €250 million this year, all of this linked of course very closely to the Malian government's efforts to implement the road map,” Catherine Ashton, the EU foreign policy chief, said on 18 February 2013. The EU also provided €20 million to improve security, provide public services and help prepare for presidential elections in July 2013. “Further financial aid will follow,” she said. But not everyone agrees that pumping money into nations with deep troubles pays off. The EU has spent €3,700 per capita in aid since the conflict began in Afghanistan, five times the country's per-capita GDP, said British Conservative MEP Nirj Deva, a member of the European Parliament’s development committee, telling a parliamentary hearing that other needy countries suffered because of the fortunes spent in conflict zones. “ActionAid agrees with the European Commission’s proposal to focus most of its aid on the poorest,” the South African advocacy group said an assessment. “But the emphasis needs to be on the poorest people, not the poorest countries, which are not one and the same. The majority of the world’s poor today live in middle-income countries. These countries in many cases experience high levels of growth. But that growth is not being enjoyed by the poorest, who are held back by unequal opportunities and power relations within society. “Dropping support to those people in the coming two years will have major implications for the global fight against poverty, which the EU needs to be aware of,” the group said. “People across Europe will expect their leaders to do better than this. Despite the tough times, 85% of Europeans still support development aid. And in recent weeks, a number of governments including France, Denmark and the UK have spoken out in favour of protecting the aid budget. There have also been positive signals from Germany. Now is the time for these countries to stand up and fight to keep Europe’s promises to the world’s poorest. It will be up to EU leaders to make sure all lifesaving aid is protected: cuts cost lives." "Given the importance of women in agriculture, education of women would create investments and provide skills for a critical evaluation of innovations, improve knowledge about methods of production and increasingly advance women’s entrepreneurial ability," Hailemariam Teklewold, a researcher at Gothenburg University in Sweden, told EURACTIV in an interview. “The problem of hunger and malnutrition is related to food availability but is not the only factor,” said Ricardo Fuentes-Nieva, who heads Oxfam’s research team in Britain and is the author of a recent report on hunger in Africa. “Donors have begun to recognise social protection is one of the important of things that should be done … as part of their development aid,” Krzysztof Hagemejer, policy development chief in the International Labour Organization’s social security department, told EURACTIV, noting that the EU has recognised this in its Agenda for Change. United Nations: The Millennium Development Goals work! It is wise policy to concentrate on LDCs. Setting priorities seems an absolute necessity for such assistance. The results embarasse any person. So bad spending before people get a tiny help. we should be ashame to call it help do poverty. is help to Pseudo-assistance high-rank specialists.